Intermodal transport in Poland continues to grow year by year. In 2017 the volumes increased by 14.8 per cent. Last year, intermodal traffic on the Polish railway network set a growth of 15.6 per cent by having exceeded 17 million tonnes in freight volumes. “It is an excellent result. Intermodal transport has grown much faster than the rest of the market”, noted Ignacy Góra, President of the Office of Rail Transport (UTK). In contrast to growth of intermodal traffic, the total rail freight volumes in Poland increased by only 4 per cent. Comparison with 2010 data demonstrates the same trend. Intermodal transport has almost quadrupled since 2010, when volumes handled amounted to 4.4 million tonnes. 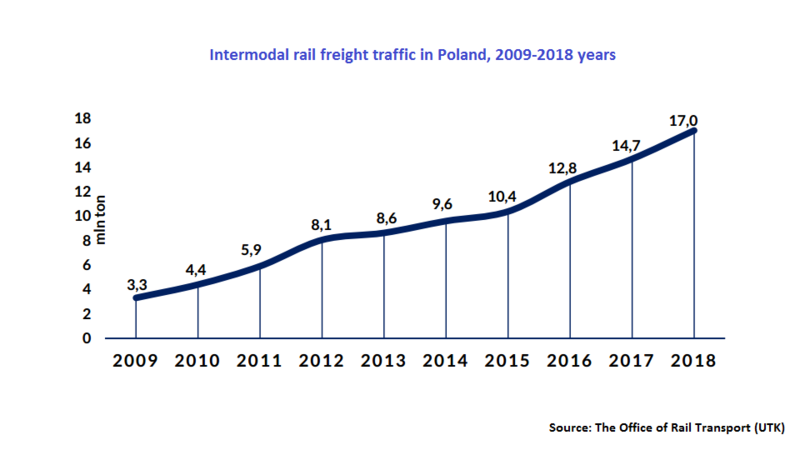 Meanwhile, the entire rail freight market in Poland has grown only by 3 per cent from 250.25 million tonnes in 2010 to 257.9 million tonnes in 2018. The most popular routes for intermodal traffic run from the Belarusian border to the border with Germany and Czechia. Other intermodal lines connect the Polish major seaports of Gdansk and Gdynia with several hinterland terminals. The vast majority of intermodal rail traffic in Poland consists of 20-feet (47.8 per cent) and 40-feet containers (43.8 per cent). The remainder includes containers of other dimensions (45-, 30-, 25-feet units), lorries and articulated lorries as well as semi-trailers. In 2018 intermodal transport was provided by 21 rail freight operators (there were 18 companies in 2017). PKP Cargo has remained the largest market player. In 2018 the company carried around 7.9 million tonnes or 46.46 per cent of the total volume. Four other rail operators have a share of more than 5 per cent: Captrain Polska – 13.73 per cent, PCC Intermodal – 10 per cent, DB Cargo Polska – 7.54 per cent and LTE Polska 6.03 per cent. Five companies have obtained a market share from 1 to 5 per cent: Metrans – 3.65 per cent, Lotos Kolej – 2.79 per cent, Ecco Rail – 2.09 per cent, Eurotrans – 1.62 per cent, PKP LHS – 1.51 per cent. The remaining rail freight operators have a share of less than 1 per cent: Rail Polska, ZIK Sandomierz, CTL Logistics, Karpiel, Inter Cargo, STK, CD Cargo Poland, Olavion, Transchem, EP Cargo and Bartex.